August 2, 2015 By Leroy Thompson & filed under All Articles, Rifles & Carbines, Weapons. Beretta has a long history of gun production, including fine shotguns. However, when people think of Italian combat shotguns, the first name that comes to mind is likely Benelli rather than Beretta. Beretta did produce the Model 1200/1201, which saw use with a few law enforcement agencies but never achieved wide usage. Beretta has recently introduced an updated tactical shotgun that I think will be more successful. Designated the 1301 Tactical, it is designed for reliability, ergonomics, ease of operation, and rapid engagement. Right side of Beretta 1301 Tactical shows good-sized cocking handle, trigger guard that is large enough to allow wearing gloves, and safety’s large head. Out of the box, it incorporates features that I (and many others) find desirable on a combat shotgun. For example, it has a large ribbed cocking handle that is no-slip and can be kicked or banged against a tree or post if necessary to remove a stuck shell. Also oversized is the thumb safety located on the receiver toward the front of the trigger guard. It can be reversed for left-handed shooters. The trigger finger easily hits it as it moves toward the trigger. Applying the safety takes a bit of time, as a finger on the support-side hand has to be used or the shooting hand must reach around under the trigger guard. Since speed is only necessary when releasing the safety, this is not a major issue. A bolt release is located on the receiver just behind the forearm. It is long enough to be easily reached, but I did not find the positioning optimal. I am used to hitting bolt releases with the palm of my support (left) hand, which I cannot do with this system. That doesn’t make it bad, just inconvenient for me. I can release it by running my trigger finger forward, but it takes a fairly heavy push to release. SureShell shotshell carrier and short rail, and Briley magazine extension. This bolt release does offer a useful feature in that rounds can be unloaded without having to chamber them by pushing the shell carrier up while pressing on the rear of the bolt carrier release lever. I find the 1301 Tactical’s sights very usable. The front is a post with white dot insert protected by ears. The rear is an adjustable ghost ring protected by ears. White dots on either side of the ghost ring allow alignment with the white dot in the front post in low light. This is a good sighting system for either buckshot or slugs. A short Picatinny rail atop the receiver allows use of a red dot sight. The 1301 Tactical cycles very quickly, so the deeply checkered forearm and pistol grip aid in controlling the shotgun when firing. Fast engagement with the 1301 Tactical is attributable to the BLINK operating system, which incorporates a cross-tube gas piston. 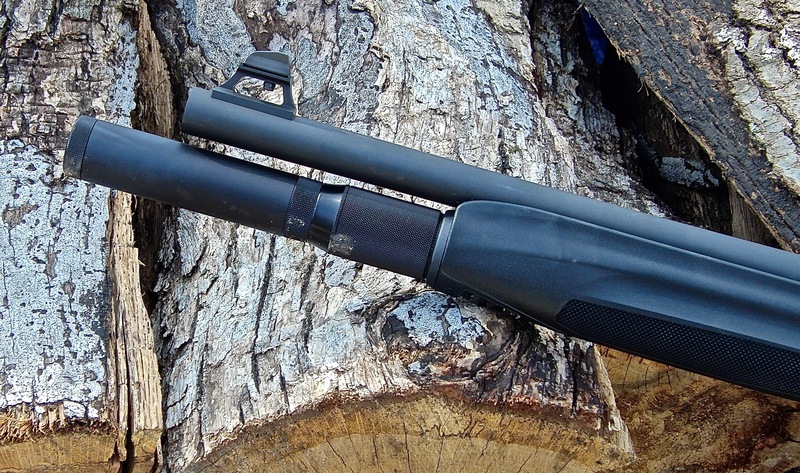 Beretta claims the 1301 Tactical cycles 36% faster than any other shotgun on the market. I will say that based on my shooting tests, it is very fast, and I’m used to shooting Benellis, which are known for their cycling speed. For comfortable shooting, length of pull and drop are adjustable via spacers. The recoil pad is very thin and, while recoil is cushioned to some extent by the semi-auto action, I did find recoil very noticeable with three-inch shells. A thicker recoil pad would be appreciated. To test the 1301 Tactical, I fired 100 rounds through it using different types of buckshot as well as slugs. The 1301 Tactical does not have interchangeable chokes and is cylinder bore. My best pattern at 15 yards was with Olin 2¾-inch GI 00 buckshot, which gave a seven-inch pattern. For comparison, at 25 yards, Federal three-inch Magnum, #4 Buckshot put its 41 pellets into 19 inches. Using Federal Tactical 2¾-inch slugs, I shot a three-shot, 50-yard group of 2.5 inches. Firing on plates at varying distances between 15 and 35 yards, handling was fast as advertised, and I found the ghost ring sights let me move among targets quickly. 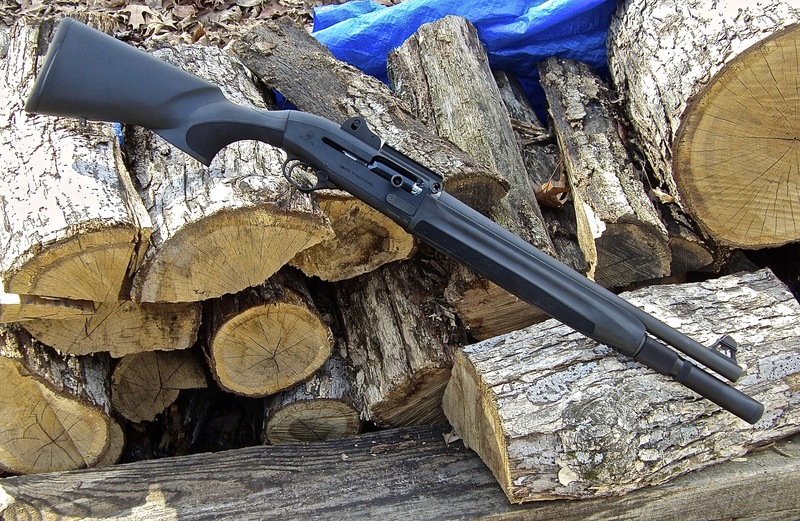 Accuracy was aided by a good trigger pull for a shotgun—four pounds, according to factory literature. Overall, I like the 1301 Tactical, though I recommend two enhancements. 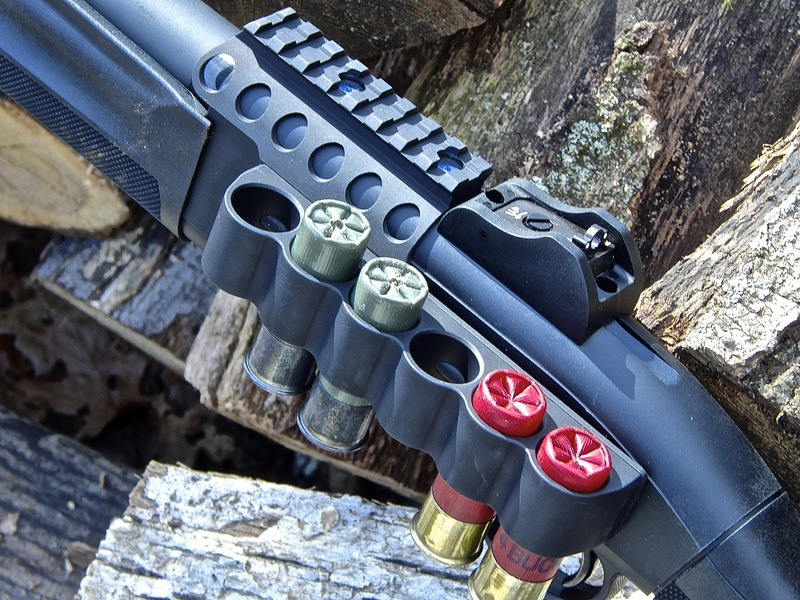 Mesa Tactical SureShell shotshell carrier and rail. Ghost ring sight with white dots is very useful for low-light aiming. The two upgrades I feel are necessary to maximize the 1301 Tactical’s ability to shoot fast are both related to cartridge capacity. Due to import restrictions, the 1301 Tactical comes with a tubular magazine with four-round capacity. Actually, when the buyer receives the shotgun, the magazine is blocked to a two-round magazine capacity to meet hunting regulations. 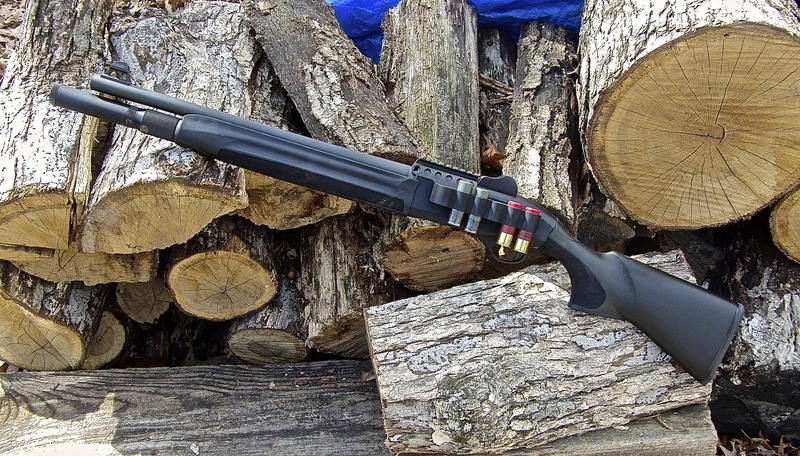 Removing the limiter is not as easy as on some shotguns but is relatively straightforward. Still, for a self-loading combat shotgun, I prefer a larger magazine capacity. Various aftermarket manufacturers make extension tubes. I’ve always liked Briley’s products, so I installed their two-shot extension tube to gain a 6+1 capacity. Thompson fires Beretta 1301 Tactical after rounding cover. I have mixed feelings about receiver-mounted shell carriers, as they sometimes get in the way when exiting vehicles or moving in confined spaces. I have also banged my hand on them when shooting off of my left shoulder. But overall, I like the ready availability of extra shells, especially for a self-loader such as the 1301 Tactical that gobbles ammo. I installed the six-round Mesa Tactical SureShell® shotshell carrier, which also has a Picatinny rail that replaces the one standard on the 1301 Tactical. It is easily installed and fits solidly. By the way, I have found that inserting the shells brass down lets me feed into the tube faster. If I have two types of ammo, I position one type brass up and one type brass down. 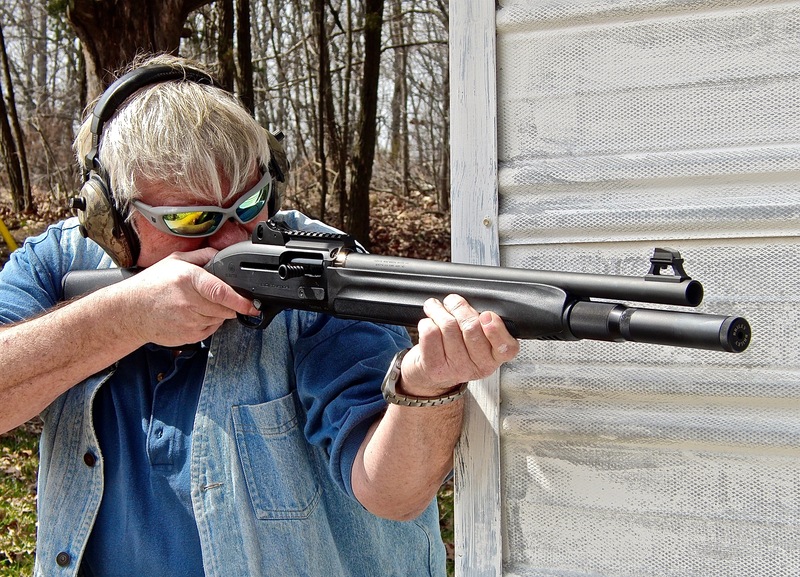 The Beretta 1301 Tactical is fast handling, as a self-loading combat shotgun should be. And it is reliable, as all combat shotguns should be. Suggested retail price is $1,075.